"Give er fire." 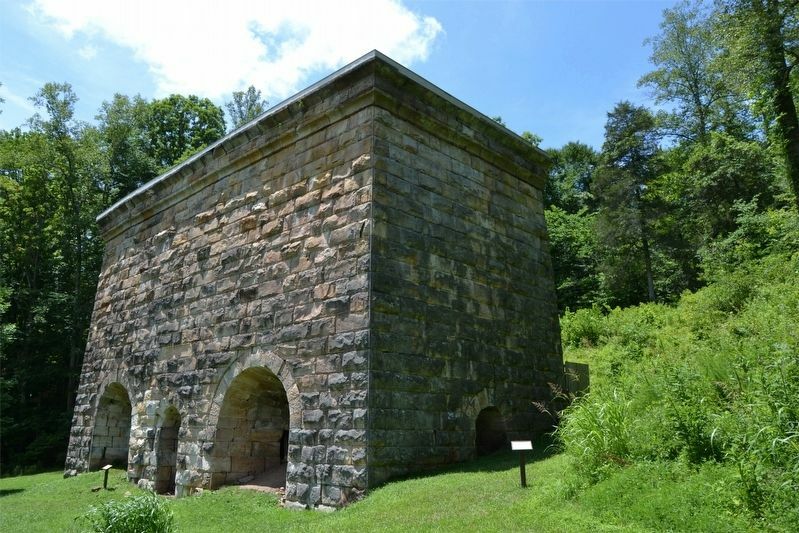 This cry ran through the woods as colliers tended huge piles of charring wood, which would be used as fuel at Fitchburg Furnace. Colliers, men who made charcoal, built many coal pits or hearths throughout the mountains during the summer months. A master collier and one or two helpers might work seven to nine pits at a time. Once fired, they had to be tended day and night so that the wood would not ignite and burn completely away. 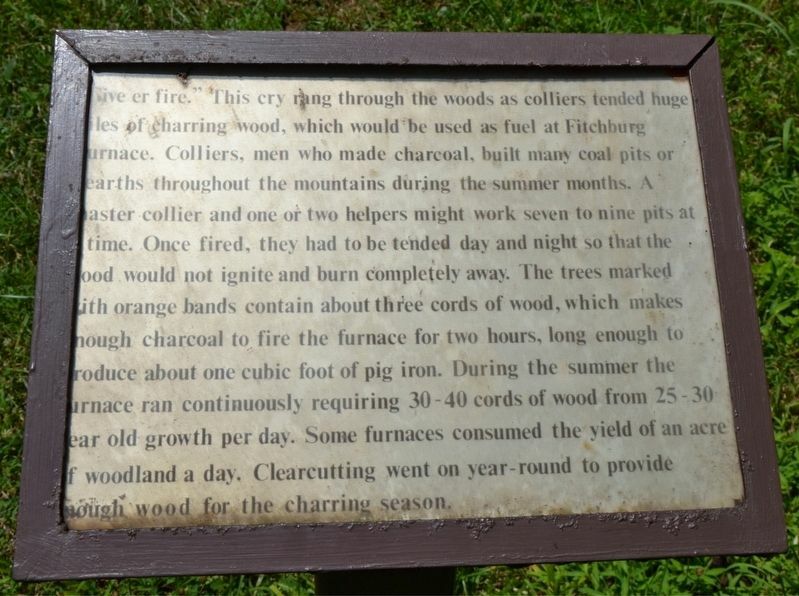 The trees marked with orange bands contain about three cords of wood, which makes enough charcoal to fire the furnace for two hours, long enough to produce about one cubic foot of pig iron. 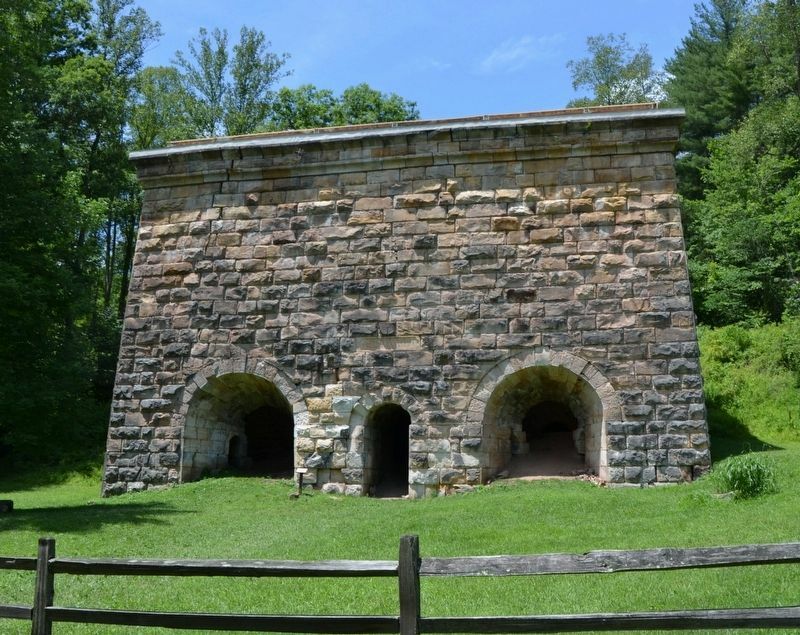 During the summer the furnace ran continuously requiring 30-40 cords of wood from 25-30 year old growth per day. Some furnaces consumed the yield of an acre of woodland a day. Clearcutting went on year-round to provide enough wood for the charring season. Location. 37° 43.996′ N, 83° 51.166′ W. Marker is in Fitchburg, Kentucky, in Estill County. Marker can be reached from Fitchburg Road 3.1 miles north of Kentucky Route 52. Touch for map. Marker is in this post office area: Ravenna KY 40472, United States of America. Touch for directions. markers are within 10 miles of this marker, measured as the crow flies. A different marker also named Fitchburg Furnace (a few steps from this marker); a different marker also named Fitchburg Furnace (within shouting distance of this marker); a different marker also named Fitchburg Furnace (within shouting distance of this marker); a different marker also named Fitchburg Furnace (within shouting distance of this marker); Woody Stephens and Forty Niner (approx. 8.3 miles away); County Named, 1852 (approx. 8.3 miles away); Courthouse Burned (approx. 8.3 miles away); Collecting Red River's History (approx. 9.6 miles away). Touch for a list and map of all markers in Fitchburg. Credits. This page was last revised on April 1, 2019. This page originally submitted on March 30, 2019. This page has been viewed 89 times since then. Photos: 1, 2, 3. submitted on March 30, 2019. • Bill Pfingsten was the editor who published this page.